Dr. Abbate was born and raised in Massachusetts. He attended medical school at the Mayo Clinic. After receiving his medical degree, he returned to Boston for his surgical training at Harvard’s Massachusetts General Hospital (MGH). 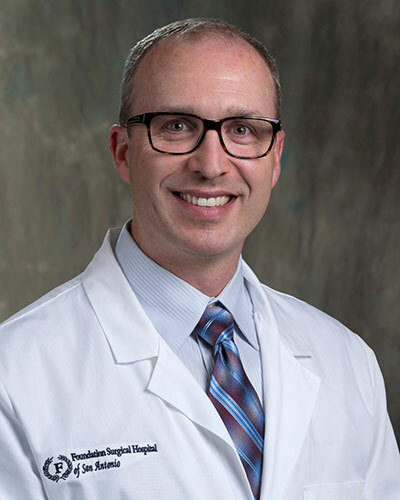 Dr. Abbate was a distinguished resident and was selected to serve as Chief of the Surgical Teaching Service for a year after completion of his surgical training. While at MGH, under the mentoring of pioneering pancreatic surgeon, Dr. Andrew Warshaw, Dr. Abbate gained expertise in pancreatic, biliary and complex gastrointestinal surgery, areas in which he has special interest. In 2002, Dr. Abbate moved to San Antonio to serve in the United States Air Force. Dr. Abbate’s military career was distinguished and included a tour as a combat surgeon in Iraq. He received an honorable discharge in 2006. In 2006, Dr. Abbate began a solo surgical practice in San Antonio. In 2010, he merged his practice with the START Center for Cancer Care. His practice encompasses the full spectrum of general surgery, including minimally invasive surgery, endocrine surgery, breast surgery and surgical oncology, but his area of clinical interest is in the treatment of gastric and pancreatic cancers. Dr. Abbate is certified by the American Board of Surgery and a Fellow of the American College of Surgery.